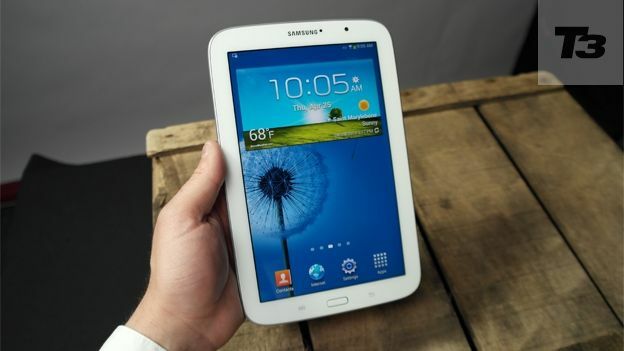 The Samsung Galaxy Note 8.0 inspires creativity but has it got what it takes to beat the iPad Mini or Google Nexus 7? In a world where it takes something special to stand out, Samsung has the S-Pen to wave at its competitors and under the noses of prospective 7-inch-ish tablet owners weighing up whether they should go for the iPad Mini, Google Nexus 7, Kindle Fire HD and now the Samsung Galaxy Note 8.0. We thought the S-Pen-toting Galaxy Note 10.1 was a good tablet but it didn't blow us away by any stretch of the imagination so now bridging the gap between the Samsung Galaxy Note 2 and the Samsung Galaxy Note 10.1, the Samsung Galaxy Note 8.0 has been ushered out with similar multitasking prowess and the capability to make Dom Joly-style phone calls. Line this up against the Samsung Galaxy S3 or Samsung Galaxy S4 and you can see where the design inspiration is taken from with the curved plastic body and white bezel set against a grey bezel which is not as thick as it was on the Note 10.1. It's a welcome change aesthetically, but ultimately doesn't change the fact that it still looks cheap when compared to the iPad Mini or Nexus 7. We tested the US Wi-Fi model (which meant no call functionality) and weighing in at 345g with a 7.95mm thickness it's both heavier and more portly than the smaller Apple tablet. It's actually slimmer than the S3 (8.6mm) and the Note 2 (9.4mm) and is comfortable and nicely weighted to use in one hand. Thankfully, the Note 8.0 ditches the proprietary charging cable for a micro USB port with a microSD card slot on the left edge and volume and on/off button squeezed together over on the right with the IR blaster just below. Up top, there's the headphone jack while stylus pocket and speakers sit below the three main buttons and instantly become an performance issue when using the tablet in landscape mode. If you're after that pen on paper feel on a tablet, then the S-Pen is still by far the closest to delivering that experience and it's improved since its implementation on the Note 10.1. There's a similar set of compatible apps with the addition of the confusing Awesome Note HD and the fun Paper Artist but we found taking notes on S Note still the most productive tool to use. That's not to say that we didn't occasionally have issues with the palm recognition that we managed to avoid on the larger Note device. Of all of the Note features, it's the Multi-Window that we really love for the ease with which running two apps simultaneously in landscape or portrait mode can be achieved without performance issues. Accessed by holding down the Back button which launches a customizable side loading app tray, you can simply drag apps onto the screen. We found using S Note and browsing the web the most useful but it's also great for watching video and works well within the confines of the 8-inch display. The IR blaster inclusion means the Note 8.0 can be used as a universal TV remote via the pre-installed Peel app and despite being relatively pain-free to set up if you have a modern set, the response to change channels or access recommended shows was so slow that we quickly reverted back to the standard remote. Among the other notable new features is the eReader view illuminates the screen to make reading more comfortable and there are a few S4 features that also make the cut including the Smart Stay function which uses eye tracking technology to turn off the screen when you're not looking at it. There's also motion support to allow you to swipe the screen with your hand to take a screenshot and mute the volume by placing your entire hand over the screen but we had little success getting the latter to work. It's the same 5-Megapixel rear-facing camera as the Note 10.1 minus the LED Flash but it seems like Samsung can't decide on a standard for the front-facing camera dropping from 1.9 on the biggest Note to 1.3 Megapixel. Again you shouldn't expect spectacular results and despite the inclusion of Auto Focus, the pictures we took delivered noisy images lacking the vibrancy and detail to warrant taking this out to snap over a smartphone. On the video front the Note 8.0 shoots 720p HD quality movies but like the Note 10.1 it's largely underwhelming, offering dull and ordinary footage. With a resolution of 1280x800 the screen display is exactly the same as the Samsung Galaxy 2 10.1, a device that's two years old which is both surprising and disappointing as we hoped there might be a display comparable to the Nexus 10. The screen is bright and vibrant enough for watching video and the 189 PPI pixel density means it does have improved levels of clarity compared to the Note 10.1 and the iPad Mini. On the whole it will serve up a decent enough display for multimedia consumption and browsing. Powering the Note 8.0 is an Exynos 1.6GHZ quadcore processor with 2GB of RAM that comfortably takes care of multi-tasking features like Multi-View and running multiple apps in the background. The skinned Android Jelly Bean 4.2.2 means it's a slick operator to navigate around and the extra cores really show its value when browsing the internet which is extremely rapid particularly when using Chrome. A 4,600maH battery means its halfway house between the Note 2 and Note 10.1 in terms of capacity and Samsung claims you can get up to 8-9 hours of time with it. We have to say that the device dropped battery life quite quickly after an hour of streaming but did make it through a day of heavy usage. On much lighter use it lingered for a few days, but we'd say it averaged around seven hours before it needed charging again. It feels like we've said this about many Samsung tablets before, but the Note 8.0 is almost a great tablet. The inconsistency of features throughout the Samsung tablet range is frustrating. While we can reserve praise for the S-Pen and its brilliant multi-tasking prowess powered by its quadcore innards, we can't be as glowing about the uninspiring design, battery life and a display that we hoped would've been a higher resolution. If you love the idea of a traditional writing and drawing experience and prefer the more portable appeal over the Note 10.1 (or think the Note 2 is too small) then this is for you. If you're not really sold on the idea of brainstorming ideas with an S-Pen, but want a smaller sized tablet, the Nexus 7 or iPad Mini are cheaper options to go for instead.